Catering Ottawa | Ottawa Bagels | Kettleman's Bagel Co.
Ottawa/August 10th, 2017 – The 24 hour a day operation that is Kettleman’s Bagel Co was briefly brought to a pause, emotionally at least, with a heartfelt message received from a local mother at the beginning of August. Carolyn Gauthier’s son Jacob was diagnosed with muscular cancer in mid 2016 and had recently celebrated one full year since his last chemo treatment. She reached out to the popular business with a moving story. “Throughout treatment, as it happens to some, the taste of certain foods did not agree with him. Your plain bagels, though not always able to finish one in a day, and your karnatzel meat sticks were his main stays. Even now a year later, with all clear MRIs and X-rays, bagels and karnatzels are a great treat. So without knowing it, you helped my son through a very difficult time”, said Mrs Gauthier. Owner and founder Craig Buckley was touched by the personal message received via their Facebook page and wanted to hear more of Jacob’s inspiring story. Mrs Gauthier proceeded to explain the difficulty that Jacob had in maintaining his appetite and the challenge of getting protein and carbohydrates into his system during chemotherapy. Kettleman’s plain bagels and classic karnatzels, the hanging dried beef sausages that patrons have come to expect near the cash register were sought out staples of his diet as he fought his illness. Mrs Gauthier was reminded of her son’s preference for Kettleman’s when she returned home recently to find him snacking on them. “Jacob’s story gave us all, as a company and as individuals, perspective. We wanted to do something to pay tribute to his courage and recovery. This story is an absolute first for us”, said Mr. Buckley. As a result, Kettleman’s is dedicating September 1st, 2017 “Jacob’s Day” at all of their stores. They will be offering a special combo for $5.00 that includes a plain bagel, a karnatzel, and a drink of choice, either coffee or fountain drink. 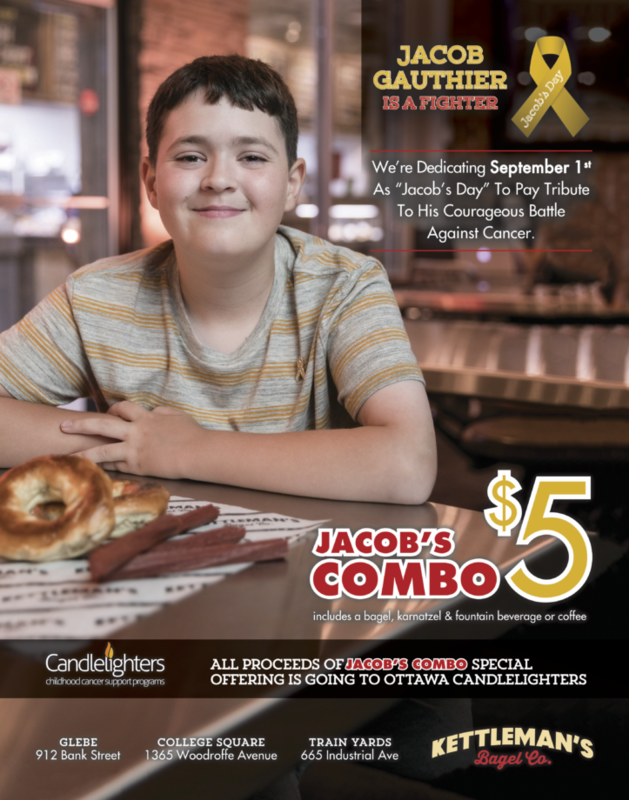 All proceed from the combo will be donated to Ottawa Candlelighters in Jacob’s name. The stores will also be conducting a fundraiser from the public to pair with their donations. Please download and view the formal release here.